Layton & Lopez Tax Attorneys, LLP, is a full-service tax law boutique serving clients throughout Orange County and surrounding areas of Southern California. The founders of the firm, Daniel W. Layton and Star Q. Lopez, have a unique combination of large law firm and federal government experience which allow them to provide the firm’s clients with a comprehensive approach to resolution of their tax cases. Layton & Lopez Tax Attorneys, LLP, is a full-service tax law boutique serving clients throughout Orange County and surrounding areas of Southern California. The founders of the firm, Daniel W. Layton and Star Q. Lopez, have a unique combination of large law firm and federal government experience which allow them to provide the firm’s clients with a comprehensive approach to resolution of their tax cases. Stop My IRS Bill is established by James Harnsberger, an Enrolled Agent and Tax Guru. No matter how small or big your tax problem is, our team can represent you to the IRS and help fix any IRS tax problems. We can also help you with tax preparation and deal with an IRS audit. Aside from tax services, we can help you structure your business the right way so you can create or build more wealth. Stop My IRS Bill is established by James Harnsberger, an Enrolled Agent and Tax Guru. No matter how small or big your tax problem is, our team can represent you to the IRS and help fix any IRS tax problems. We can also help you with tax preparation and deal with an IRS audit. Aside from tax services, we can help you structure your business the right way so you can create or build more wealth. Victory Tax Lawyers, LLP is a nationally recognized law firm based out of Los Angeles specializing in tax controversy, resolution and litigation. Victory Tax Lawyers, LLP is a nationally recognized law firm based out of Los Angeles specializing in tax controversy, resolution and litigation. The CPAs at Stewart and Associates are proud to offer customized tax services for individuals and businesses. We focus on providing you with the most accurate and efficient service possible, so you’re not waiting around for information and having to file multiple extensions. We are experienced in a variety of tax situations, from simple filings to multi-state claims. The CPAs at Stewart and Associates are proud to offer customized tax services for individuals and businesses. We focus on providing you with the most accurate and efficient service possible, so you’re not waiting around for information and having to file multiple extensions. We are experienced in a variety of tax situations, from simple filings to multi-state claims. All India ITR is about providing excellent services towards affordable online tax filing solutions for individuals and businesses. We believe in using technology to attain accuracy that walks towards excellence and our service line is built with this thought. We are working to break the myth of tax filing process that it is a time taking and hard procedure which is mandatory to complete. All India ITR is about providing excellent services towards affordable online tax filing solutions for individuals and businesses. We believe in using technology to attain accuracy that walks towards excellence and our service line is built with this thought. We are working to break the myth of tax filing process that it is a time taking and hard procedure which is mandatory to complete. We are a Chicago IRS Tax Law Firm specializing in IRS problems including tax audits, tax appeals and litigation before the IRS, IDOR and the United States Tax Court. Expertise in tax bankruptcy discharge of tax debt. We specialize in Tax Law, Corporate Law and Bankruptcy Tax Issues. Areas of practice include: Illinois Sales Tax, Tax Audits, Tax Debt, Offshore Voluntary Disclosure (FBAR Fillings), Offer in Compromise, Installment Agreements. We are a Chicago IRS Tax Law Firm specializing in IRS problems including tax audits, tax appeals and litigation before the IRS, IDOR and the United States Tax Court. Expertise in tax bankruptcy discharge of tax debt. We specialize in Tax Law, Corporate Law and Bankruptcy Tax Issues. Areas of practice include: Illinois Sales Tax, Tax Audits, Tax Debt, Offshore Voluntary Disclosure (FBAR Fillings), Offer in Compromise, Installment Agreements. Esquire Group is a boutique international tax advisory firm working with both corporate and individual clients and helps them in tax planning and structuring. We offer various services like tax consulting, expatriation, tax preparation, dealing with reported foreign income or assets, tax problem resolution, asset protection, entity services, etc. Esquire Group is a boutique international tax advisory firm working with both corporate and individual clients and helps them in tax planning and structuring. We offer various services like tax consulting, expatriation, tax preparation, dealing with reported foreign income or assets, tax problem resolution, asset protection, entity services, etc. 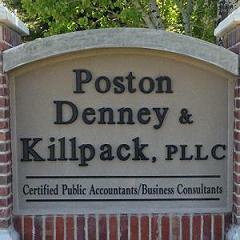 Poston, Killpack & Denney, PLLC, is the Idaho Falls accounting firm to contact for all of your financial services needs. When you need an Idaho Falls certified public accountant, or CPA, you can count on the team at this accounting firm to provide you with friendly service and accurate, timely results. The right financial services can free up your time today and can help to ensure that your finances are in order on a regular basis. Poston, Killpack & Denney, PLLC, is the Idaho Falls accounting firm to contact for all of your financial services needs. When you need an Idaho Falls certified public accountant, or CPA, you can count on the team at this accounting firm to provide you with friendly service and accurate, timely results. The right financial services can free up your time today and can help to ensure that your finances are in order on a regular basis. Serving Bossier City, LA and outlying areas, Lake George of Lake George Financial Group is offering the following services not limited to: Estate Conservation, Tax Management, Insurance and Annuity products, Retirement Planning and Investment Strategies. Serving Bossier City, LA and outlying areas, Lake George of Lake George Financial Group is offering the following services not limited to: Estate Conservation, Tax Management, Insurance and Annuity products, Retirement Planning and Investment Strategies. Wilson Tax Law Group is a tax law firm with offices in Newport Beach and Yorba Linda, California. Our firm serves the Orange County and Los Angeles areas and can help you with any problem involving the IRS, state, county, and city tax agencies. The Wilson Tax Law Group has extensive experience in civil audits, estate tax return audits, FBAR penalties and filings, offshore voluntary disclosure (OVDP), tax appeals, tax collection, real and personal property tax, sales tax, and criminal tax. Wilson Tax Law Group is a tax law firm with offices in Newport Beach and Yorba Linda, California. Our firm serves the Orange County and Los Angeles areas and can help you with any problem involving the IRS, state, county, and city tax agencies. The Wilson Tax Law Group has extensive experience in civil audits, estate tax return audits, FBAR penalties and filings, offshore voluntary disclosure (OVDP), tax appeals, tax collection, real and personal property tax, sales tax, and criminal tax.